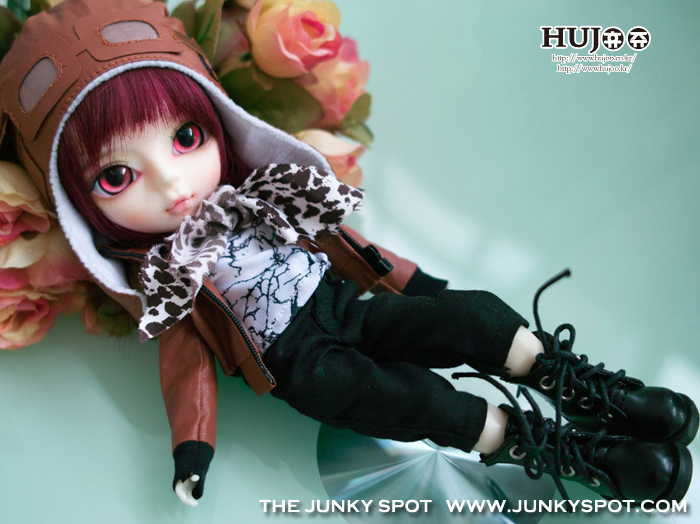 Emory the Evil, also known as JunkySpot, got in a new Hujoo called Yomi. Available on boy or girl body, blank, faceup or fullset. I could not resist that face - fullset boy is coming home. I hope I get the red eyes. I'm not really in to Hujoos, but this fullset may have to come home with me. I really debated getting a girl and passing the clothes to my other Hujoo boys but then I decided on a boy so everyone could share clothes. Finally, I did not want to deal with yet another whole new wardrobe just for a girl doll. Without a faceup or clothes the doll will be a lot less money and I know you can do faceups. I did my first 'commission' face recently, and on a Hujoo girl. I really should post about that. Derpy me. Dang he's cute-you and your tiny army of cuteness! He will be 26cm big headed boy. I think I will keep the name Yomi for him. I like it. I need to find out if it has a Japanese meaning or two and see if it will fit his personality when he finally tells me what it is. Never thought I would get into big-headed dolls, but they are fun, inexpensive and have a lot of personality.